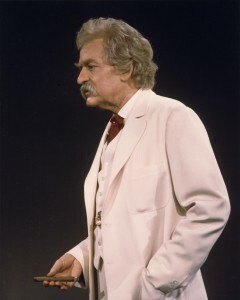 Cyndy and I had tickets to see Hal Holbrook’s “Mark Twain Tonight” performance at Bass Hall in Fort Worth last night. Unfortunately, we had to miss J.D.’s last game in the Fall baseball tournament at the Ballfields at Craig Ranch in McKinney. He plays on the Stephen F. Austin State University Baseball Club Team. They won the game Friday afternoon, but lost the two games Saturday, so they did not advance. But, with the exception of the game they won, the scores had only a one or two run differential. I was able to see the Friday game. Cyndy, Cameron, and I went to the 2 p.m. game yesterday in which he played more than in the other two games. The game went a little past the time it was “supposed” to end, so Cyndy and I did not have time to eat before getting to Fort Worth. We parked in the free (on weekends and for Bass Hall events during the week) parking garage next door. This was the first time we have been to Bass Hall. We went to see Brewer and Shipley in a smaller building run by Bass Hall. Which was why I received the email from them during the summer offering a pre-sale ticket price to see Hal Holbrook at something like half-price. With that deal, I figured, what the hell, “go for the gusto,” and I got seats in the orchestra pit. I knew we were close to the stage, but having never been there, I did not know how close. I showed the woman at the door our tickets so she could scan them. We had a little time so we just wandered around. We came upon a bar and got a couple of beers. A lady came up to us and asked if we wanted to order and pay for our drinks for intermission then and have them waiting at intermission, bypassing the lines. Well, yeah! When we finished our beers, it was about time to head on into the hall. I asked an usher in the hallway where our tickets were. We walked to an entrance of the hall and asked if we were in the right place. Which is what we did. We got to the other side and found that our seats were indeed in the second row. At which time I took a picture of the stage ( since pictures were forbidden during the performance). I posted to Facebook saying I was waiting for the show to start from the second row. Before the show began, an usher walked up and asked if she could see my tickets. I said “sure” and showed them to her. Then I turned them right side up so she could actually read them. We were in row BBB, seats one and two. According to the seats across the aisle, we were on the right row. But our section was lacking row AAA. Our seats were on the front row! Granted it was only a row difference, but I didn’t know we were that close anyway, and how often do you get to say you were on the front row? And that was not the best part! We have seen Hal Holbrook’s performance on television and I have wanted to see the show for years. As a writer, humorist, and songwriter myself, he and Mark Twain were two of my mentors, so to speak. Although to be honest, I don’t think either one of them ever wrote a song, but you get my point. Hal Holbrook is also a terrific actor – I like every role I have seen him play (maybe not the character he played, but the way he acted the part). He did not disappoint us, even though we were not expecting him to. Holbrook’s performance was precisely as good as I was expecting. Being on the front row really, really helped. There were only a very few times when we could not understand a word or two – which was another bonus. I do not know about the people in the back of the hall. This is the actor’s 60th year doing Mark Twain. I am here to tell you that he puts as much into his performance and loves being Mark Twain as much as he has since he conceived of the idea in 1954. At 89 years old this year, he added three new “numbers,” adding another hour to the repertoire of material. It said in the program that Holbrook will not tell a venue what numbers he will do because he does not want to be limited. He often decides what is next during the performance. Holbrook made eye contact with us – and others on the front few rows. I have been told that I am a good audience. As a performer myself, I try to watch everyone I see perform as I would want them to watch me. I rarely look away and I look intently – did I say I was a writer? Cyndy and I popped up when they turned the lights on for intermission. We went to the east side of the building and, sure enough, our beers were waiting for us. The second half of the show was as excellent as the first. When he came out during the applause, he made eye contact with us again. Which I must say was not only thrilling, but the perfect end to a fine performance and a pleasant, intimate evening. And we finally got to eat when we got home.